The first one, the little 270 EX is something that is not recommended to be worth buying. The reason is that it’s not a full-size flash that you can tilt and bounce off walls and ceilings. It does fit on the camera’s hot-shoe, but it’s just a glorified version of a camera’s built-in pop-up flash. It’s also very low so it doesn’t get very far away from the lens axis and it doesn’t have any auto-assist beam to help you focus. If you’re going to buy a flash, you may as well spend a few extra dollars and get a full-size, fully-fledged flash like the 430 EX II or the 580 EX II. If you’re getting your first flash, the little Speedlite 430 EX II is great if you’re only going to have one flash for night stuff and bounce mode etc. 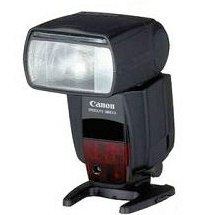 It’s also the least expensive of the two and it’s in the mid-range of the Canon flash line priced at around $200 to $250. 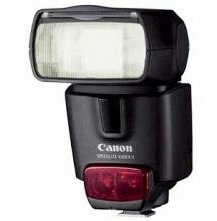 The larger flash for Canon cameras, Speedlite 580 EX II is the mothership and is the top of the line for Canon right now. It’s around $200 more than the 430 EX II so it’s a significant difference in price. It has a little more power of course which gives you a little more range and it has a better ability to let you focus on things in the dark since it has 3 red LED’s in it’s auto assist light whereas the 430 EX II only has two. Unless you really need the power, there’s no need to ignore the 430 EX II. They both have auto-assist beams, they are both fully-pivotable so you can bounce them off things. Their differences are in fact rather minor. If you’re using them just as a flash on your camera it’s not that important to get the bigger one. The key difference and what is a real deciding point between them is whether you want to use it as a master control unit to control remote flashes. If you want to do off-camera flash photography, and you’re using one of these as a master, you’ve got to get the 580 EX II because that’s the only one that serves as a master and can control the other flashes as remotes. If you already have the Speedlite 580 EX II, then the 430 EX II would make a great remote flash because it can function as a slave but not a master. Many pros still use the Speedlite 430 EX II even when the bigger one is available since it’s smaller and lighter and that can make a big difference on a long shoot. These are the best options when choosing a flash for Canon cameras.